Measuring up for new curtains or blinds may sound like a daunting task. At The Fabulous Fabric Company we've put together an easy-to-follow guide that will walk you through the process and eliminate any uncertainties you may have. Don't underestimate the importance of this step. incorrect measuring may mean the curtain or blind will not fit properly, or render it unusable. B. Measuring the drop: To measure the drop it is important to measure the finished length of the curtain from the pole to your desired length on the wall or floor. Normally the pole should positioned 15cm above the opening and can be measured down to sill length, below sill length or full length to the floor as well as the option of looping onto the floor. For tracks: measure from the top of the track to allow it to be hidden by the curtains. For poles: measure the underside of the curtain ring to allow the pole to be seen above the curtains. For pencil pleat, french pleat or goblet top curtains: measure the drop from the eye - the small metal ring at the bottom of each curtain ring. This will prevent the pole or rings from being obscured by the curtain. For tab top and eyelet curtains - measure from the top of the pole. To minimise light exposure we recommend that the pole be positioned a minimum of 15cm above the top of the window. Blinds can sit either inside or outside the window recess so it's important to decide which option you want to go for before measuring up. A. 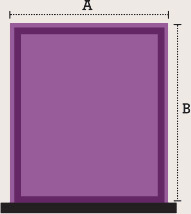 Measuring the width: Measure the width of your window recess from wall to wall. Take measurements at three different points just in case your window is not square and record the smallest measurement. This will also ensure that the blind does not snag when being lowered. B. Measuring the drop: Measure the height of your window recess from top to sill. Take measurements at three different points just in case your window is not square and write down the smallest measurement. A. Measuring the width: Measure the width that you would like your blinds to be from points on either side of the window recess. B. Measuring the drop: Measure from the required position above the window down to the required length. Make a rough drawing of the window or space, and on it write down each measurement as it is taken. (You can e mail or fax this to us). Always measure with a steel tape measure as a cloth or plastic tape may stretch. Measure and record to the nearest millimetre. Measure each window / door in 3 places (yes most apertures are not straight) and take the narrowest width. Swallow your pride and get a second person to double-check every measurement.